Awakening from spinal or cardiac surgery with partial or complete blindness is a devastating event. The etiology of this catastrophic perioperative complication remains largely unknown, yet its incidence appears to be increasing. The etiology of postoperative blindness is incompletely understood and multifactorial. 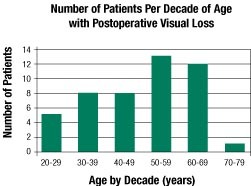 Due to this concern, the ASA Committee on Professional Liability established the ASA Postoperative Visual Loss (POVL) Registry in July 1999 to collect detailed information on these cases. The goal of the Registry is to identify potential intraoperative risk factors and patient characteristics which may predispose a patient to this perioperative complication. Although data from a registry cannot determine a definite cause and effect relationship, it can be used to find common events or characteristics between patients suffering from the same complication. This information can then be used to guide future research to determine its etiology. The POVL Registry has collected 47 cases at the time of this writing. Preliminary analysis of this data is presented in Figures 1-4. 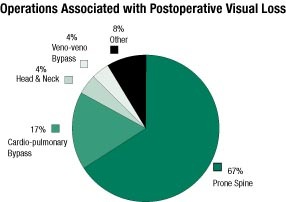 Operations associated with POVL were predominately prone spine procedures (n=31, 67%) followed by cardiopulmonary bypass cases (n=8, 17%), head and neck procedures (n=2, 4%), and liver transplantation with veno-veno bypass (n=2, 4%) (Figure 1). Other operations accounted for 4 cases (8%) and included thoraco-abdominal aneurysm surgery, lower extremity peripheral vascular surgery, a cerebral aneurysm clipping, and a radical retropubic prostatectomy. Figure 1. Percentage of cases in the POVL Registry associated with a particular operation (n=47).Figure 1. Percentage of cases in the POVL Registry associated with a particular operation (n=47). Figure 2. 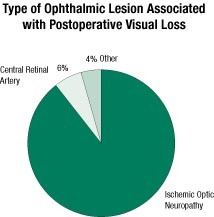 Percentage of cases in the POVL Registry associated with a particular ophthalmic lesion (n=47). The POVL Registry also differs from previously published reviews of POVL because of the high percentage (90%, n=42) of cases caused by ischemic optic neuropathy (Figure 2). Only 6% (n=3) of cases were diagnosed as central retinal artery occlusion. Of the remaining cases (n=2), one was caused by retinal ischemia after a bilateral radical neck dissection, and the other was from an unknown cause in a heart transplant patient who did not undergo a funduscopic exam. The high percentage of ischemic optic neuropathy cases may be a consequence of the proportion of cases associated with prone spine surgery. The etiology of POVL in prone spine operations may differ from that occurring with operations performed in the supine position. The prone position appears to place patients at increased risk of developing POVL. 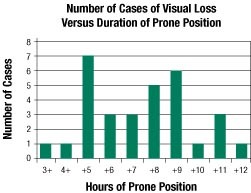 Figure 3 demonstrates the number of prone spine cases of POVL versus the number of hours in the prone spine position. The incidence appears to dramatically increase for prone times between 5 and 9 hours. However, since the POVL Registry does not contain denominator data of all cases of prone spine surgery, definitive conclusions regarding risk and duration of prone position cannot be made. Younger age does not appear to be protective. Figure 4 reveals that 21 cases out of 47 occurred in patients younger than 50 years of age. Sixteen of those 21 cases were associated with the prone position. Of those 16 cases associated with the prone position, 14 patients were ASA I or II. Although coexisting diseases may increase the risk of developing this complication, this high frequency of occurrence in younger, healthier patients suggests that intraoperative physiologic variables such as edema formation and venous congestion in the prone position, as well as "normal" physiologic variation in ocular hemodynamics, may be important etiologic determinants. Figure 3. Prone spine cases analyzed separately (n=31): number of cases categorized per duration of prone position. The low number of cases at >10 hours is most likely a result of a low denominator number for these time durations, though the POVL Registry does not contain denominator data. Figure 4. Number of cases categorized according to decade of age. Young age does not appear to be protective for this complication, although the actual incidence per decade of age is unknown since the POVL Registry does not contain denominator data. The goal of the POVL Registry is to collect detailed information on at least 100 cases so that major common characteristics/events can be identified. All cases of POVL occurring after non-ocular surgery are eligible for submission. The standardized, anonymous case report form can be accessed from the internet at www.asaclosedclaims.org under the POVL Registry subheading. These forms are most easily filled out by anesthesia and ophthalmology personnel, although input from other professions may be helpful. All information is submitted anonymously to ensure patient and health provider confidentiality. Individuals who find the forms too time-consuming to fill out are encouraged to contact the author to make arrangements for case submission. 1. Roth S, Gillesberg I. Injuries to the Visual System and Other Sense Organs. In: Benumof JL, Saidman LJ, ed. Anesthesia and Perioperative Complications, 2nd ed. St. Louis: Mosby; 1999:377-408. 2. Taugher P. Visual loss after cardiopulmonary bypass. Am J Ophthalmol 1976;81:280-8. 3. Sweeney P, Breuer A, Selhorst J, et al. Ischemic optic neuropathy: a complication of cardiopulmonary bypass surgery. Neurology 1982;32:560-2. 4. Roth S, Thisted RA, Erickson JP, et al. Eye injuries after non-ocular surgery: a study of 60,965 anesthetics from 1988-1992. Anesthesiology 1996;85:1020-7. Members of the Postoperative Visual Loss Registry Coordinating Committee are Lorri A. Lee, MD (Director of the POVL Registry), Karen Posner, PhD, Frederick W. Cheney, MD (Director of the Closed Claims Project), Karen B. Domino, MD, MPH (Chair, Committee on Professional Liability), and Robert A. Caplan, MD. Dr. Steven Roth, Associate Professor of Anesthesia and Critical Care and Chief of Neuroanesthesia at the University of Chicago, who is a nationally recognized expert in this area, is a consultant on this project. Dr. Lee is an Assistant Professor of Anesthesiology at the University of Washington in Seattle. Editor’s Note: We refer the reader to two recent articles in Anesthesia & Analgesia regarding postoperative visual loss: Anesth Analg 2001;93:1410-6 and Anesth Analg 2001;93:1417-21.